Kelly's Korner wanted to know what everybody collects so I thought I would show you guys. I hate to admit this but my collection fills that bookcase to the bursting point. Thats right I have way more cookbooks than what is showing. I even have so many that they don't all fit on that bookshelf they are also in another one in my storage room...its an obsession. I mean honestly in this picture you can only see the top 3 shelves the bottom 2 shelves are empty....for now. I just can't help it I love to cook and love love love to try new recipes. There are 2 really good reasons why that thing is such a mess. My 1 year old decided all of the sudden he really pulling my cookbooks off the shelf. So he went through and pulled and pulled till he completely cleared out the bottom 2 shelfs. The I decided since he did that I need to organize them and purge some out anyways so I would take this as a sign it was time....that was Monday and my house is covered in cookbooks. They have been shuffled and moved so many times its going to take me forever to get them all back together and really organized. I refuse to just shove them all willy nilly back in that thing. In all honesty its driving me crazy that its not done yet. So this weekend will probably be my breaking point and I will get them all back in there....well the ones I am going to keep. I have gotten better about buying cookbooks. When I quit work in 2008 I made a commitment not to buy cookbooks because I had so many and because it cost so much. Well I did good I only bought 1 in 2009. I bought 1 the other day so I guess that was my one for 2010....good thing Mother's Day and my birthday are still coming up! It doesn't count if they are gifts..lol. I have also learned not to buy cookbooks just because of the great food in them. It doesn't matter how wonderful they are if they don't fit into my family's tastes and lifestyle. So there is collection. What do you collect? Its Friday again. I had so much fun with last weeks Follow me Friday I decided to give it a go again...There are two different sites that I am participating in. Trendy Treehouse and One 2 Try check them both out! Add your blog link to the MckLinky you will find on Trendy Treehouse's Post ~ Remember to leave your blog name under Your name. Grab the Follow Me Friday Button for your blog ~ so more people can share in this FUN! Apparently I am pregnant with a gigantic baby. Warning: Before reading the following post please prepare yourself for irrational fears and emotions of a paranoid pregnant woman. If you too are paranoid please hit your back button now...do not subject yourself to more un-necessary fears. Also those sensitive to ramblings with no point and no directions would also do well to hit your back button...this is a post, this is only a post, if it were a real breakdown there would be no post. I went to the doctor today for a routine baby check up. Everything was fine...well sorta. I mentioned to my doctor that the baby was huge. She laughed and I said no I am serious....Now at this point I am 23wks and 5 days pregnant. I told her that I was uncomfortable and that the baby would press into my lungs..she said that wasn't possible yet..I said measure me. My doctor humored me. She broke out the tape measure and put it to my belly. She measured and then she re-measured...looked me in the eye and said well you measure 30 wks. Although I expected her to tell me that I measured ahead...I did not expect her to tell me that I measured 7 wks ahead...If I had not been laying down I might have fell down. She wasn't overly concerned and said the next time I come in they will do a ultrasound and get a definite idea of his size. Now 4 wks ago he was right on schedule. Weighed in at 12oz. That means I will worry and stress over this till my ultrasound in 3wks. See there is one thing that I am not good at....its awaiting medical tests or results...I mean I imagine the WORST...I have a good imagination too just ask my husband. If I have to wait for a while for a doctor's appointment when I am sick or if I have to wait to long for a result from a test it starts getting iffy up there in my brain...I google it and diagnose myself... You don't even want to know what all I have thought I have had...or how many times I have flipped out because of it...lol. I can laugh now as I look back at it...but at the time it is not funny. I think this stems from when I had cancer. Every time the doctor had a test done it was bad news...somehow that fear programmed itself into my head...so anything medical scares the crap out of me. I know and realize I fought cancer and won. Cancer is the scariest battle you can fight in my opinion....so I feel like should have came away with bravado...instead I came away with chickenidis. That's right I said it. I came away with feathers instead of armor. In the day to day battle of life I am ready to face it head on and I do have armor. Having cancer made me stronger in every possible way...except one...medical problems are my kryptonite. When it comes to anything medical the armor falls off and you can see the feathers that I have hidden underneath (I had the beak removed). Its almost a relief to say this on here...because there are only 2 people in this whole world that know how terrified I am of anything medical. My Momma is a good southern Mom so I know she won't tell...and my husband well he is a little afraid because I am a good southern wife and have a cast iron skillet...I know he won't tell. So now 3 people know. My Mom, the Hubs and you Internet. So Internet in case you don't realize it...southern women are tough...we tote cast iron skillets and we aren't afraid to use them...If you know whats good for you, you will keep the secret Internet...because if I see an article in the Enquirer about a huge beakless chicken pregnant with a gigantic baby...I am going to know who ran their mouth...and it will ruin our friendship...totally. Remember I walk softly and carry a big skillet. I made a Hootie....but no blow fish. 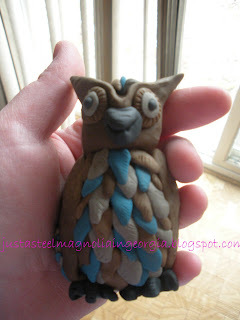 Last year I picked up clay and started I guess what you could call sculpting. I have made lots of little creatures and different things and surprisingly people want to buy them. It really took off at Christmastime when friends came over and seen ornaments that I was making for my personal tree...suddenly everyone wanted one. I sold so many ornaments I did not get to keep any for me....Well maybe I hid a Santa and a reindeer..lol. So I am currently in the process of opening an etsy store.. To sale my little creatures, ornaments, art and anything else I make. I don't mind if someone recreates Hootie for their own personal enjoyment but I do ask that you not sale him...since he is my original creation. I hope you all think he is as cute as I do. I will be linking to several parties to share my new little friend. Contact me if you want a friend of your own! Check out the links below for some inspiring ideas from other creative people. So I am back. I skipped a week last week. I cooked I just did not get around to posting my menu. I missed doing it. When I post my menu it always gives me that extra push I need to stick to my menu. There are alot of people who participate in Menu Plan Monday so head over the Organizing Junkies for lots of links and ideas. I have a few projects in the works and so that means I will be posting them later this week.. So if you come back you will see some of my sculpting. 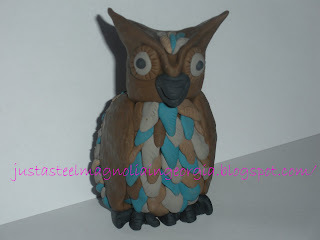 I made a cute little owl over the weekend I can't wait to show him. I will probably be posting a recipe or two. So this could be a week that ends up having lots of posts. I also have a Dr's appt for a baby check up. Everyone cross your fingers and say a little prayer for me that I don't end up with Gestational Diabetes. Friday-White Pizza I don't officially have a recipe for this one but I seen something on foodnetworks the best thing I ever ate pizza edition with a cheese with a white sauce and spinach and I want to try to make something similar. If anyone has a recipe feel free to send it to me. I also plan to make an applecrisp this week at some point. Its no secret you can look at the blogs I follow on my profile. I love to find cool fun and creative blogs. About anything from cooking, sewing , crafting, decorating, saving money, or just being a mommy. Now I found a way to find more blogs check out the Trendy Treehouse for all the links to blogs available. Add your blog link to the MckLinky below ~ Remember to leave your blog name under Your name. I entered a contest at an amazing site I found Park City Girl . The prize for the contest that she was offering was for a chance to win a fat quarter bundle called Chirp! The contest got me to her site but her amazing quilts kept me there. Over the weekend I looked at her site alot and got so much inspiration. It really got the quilting bug going again. I have quilted by hand before I made a total of 4 quilts....It takes forever by hand and since I have had my son I haven't really picked it back up. I just started learning to use a sewing machine and it has really revived my desire to create. So this whole weekend after looking and reading so much of her site I wanted so badly to make my new little baby who is due in June a new quilt. When I got a free minute today I went back to Park City Girl's site. I forgot that today was the day. Her newest post was announcing the winners. I read it never expecting to see my name. I am so excited and so thankful that I was one of the winners I can't wait to get my fabric! You can be sure that you will be seeing a post in the future showing just how I used them! Thanks Park City Girl and Fat Quarter Shop! Head on over by clicking the links above and check out both great sites! I figured out what a seam ripper was for! So this weekend was my niece's birthday party. My sister actually drove in from out of town to throw the party so it could be with family. She lives in North Carolina and we don't get to see each other a whole lot. A few times a year really at most. When my nephew was born 9 years ago (wow time really goes fast) she lived basically next door so we seen each other all the time. I got to watch my nephew grow up. It makes me really sad that I don't get to see my niece like that. Anyways it was never set in stone a certain date that she would be coming so I slowly just started gathering stuff that I would put together a gift bag for her birthday. Thats my favorite thing to do for kids. I don't like to give them one big gift I like to give them several smaller gifts. I had already gotten a few things together but needed a few more...So on Friday night I got inspiration for what I wanted. My timing is always off so wouldn't you know it that it was snowing and looking pretty ugly out there...for North Georgia snow tends to set off a panic...What I mean by that is that you can't get a loaf of bread or a gallon of milk without a fight. I have never understood that either because if it snows and your trapped in a gallon of milk won't last long unless you can keep it cold...because a good rainstorm around here knocks the power out so if you just say "SNOW" the power goes off. I know you can put it outside and all but the first thing I think of if I know I won't have power is...cans of soup or snacky junk food...because worse comes to worse you can heat a can of soup in a stoneware mug over a candle flame....at least it worked for me. (Drastic times called for drastic measures when your 13 and dramatic on top of it all) So here it was Friday night snowing and the party was Saturday afternoon. I get in my car and head to hobby lobby and buy some fabric. Then I head over to Walmart and buy a T-shirt. I came home and did lots of research online. I used a tutorial on ~Ruffles and Stuff~ . and I was able to make this. I will be honest. It did not take me the 15 minutes it took her it took me 5 hours. I will tell you why though. I don't know what I am doing...lol. I have never sewed on jersey for one and I have never used a zigzag stitch.... I have never measured fabric for a specific size and cut it out. I finally figured out what a seam ripper was for...especially since I had to use it and rip out every stitch I had done more than once. One of the times I had to do that was because I did not sew the rightsides together... So when I flipped it out the tag was on the outside and in front. It was a learning experience. I know now more about sewing than I did. I learn more everytime I make something. I am slowly but surely losing my fear of sewing. When I finally got it done and got it finished I felt on top of the world. I have never felt like that after a craft. I think it was because this was something I had to work at... I mean really work. I had to figure out how to set my machine and then I had to thread and re-thread it everytime I messed up. I had to use the seam ripper and take out all my mistakes. I am not saying that all my other crafting times I have not had to work at...I do I work on all my crafts but I usually am able to master most of them quickly. Sewing is a whole new ball game for me. I also think it made me feel so good because I did not give up when it got really difficult. I could have put it down and said I will do this later...then I may or may not have ever finished it. I didn't do that though I told myself over and over..."you can do this you can figure this out"...and I did do it and I did figure it out. I thought that after that initial burst of happiness with the dress I would never feel that satisfaction again at least until the next project...but I was so wrong. It doubled when I saw this. She played in it all evening and then she had to sleep in it because she loved it so much...Now I can't wait for my next project! I wanted to share my project over on Sumo's Sweet Stuff. Go check out the post for lots of links and see what everyone else is creating. 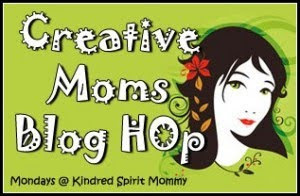 I also finally get to participate in Kindred Spirit Mommy's Creative blog hop! Head over there for even more links to check out. I needed a little craft therapy and found it at Life in the Pitts! Check out some of the links there if you need craft therapy too! 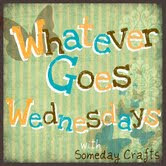 Someday crafts just started a party check hers out! I'm also joing Kara for look what I made day! I am also link up with Fireflies and Jellybeans to Show off my stuff! If you like crafts you can make an wear check out this post on The Train To Crazy for links. Everything etsy is also having a linky party for things you have made and since I made this I qualify...yay! Head over and check out some more cool projects people made! My last link up for this party...because I love her site so much check out Tatertots and Jello and you can see her linky party for her Weekend Wrap Up Party! I have wanted to learn to sew for a long time. I actually bought a sewing machine about 5 years ago....and it sat in the box for almost 5 years...except for a short 30 minute session of practicing on scrap fabric and flipping out because I am not I repeat not good with anything that has working parts...I mean seriously...I use a mixer and a food processor all the time...Do you want to know how many times I have cleaned cake batter off the walls, me , my kid, and anything else near by?...I can operate a mixer I just have technical difficulties. As far as the food processor goes its touch and go sometimes....I get it to work and do what I want but thankfully it has all those safety features that are probably the only reason I still have all my fingers. I quilt and have quilted for years...guess how I do it...By hand...why? because I was scared of that machine. (to clarify all the quilts I have done are very simple patterns basically just blocks I have arranged in different sizes) The urge to sew has gotten stronger and stronger. I have read so many blogs that show how to sew or what they have made and I thing that is what finally gave me more confidence. I wanted to face my fear head on...I mean its just a machine....so with courage I got the phone book out and found a lady offering sewing classes...lol. She allowed me to bring my machine so that the beast and I could become friends. Last week was my first class and the beast and I are on talking terms...we are working on having a relationship. My husband is always supportive so he surprised me with a beast carrier...so I can lug beast safely to and from the classroom. Then because my husband is one of those men he got me a tool box with lots of sewing gadgets...that I will probably hurt my self on...but I am determined to learn to sew. I don't technically get to sew in class till tomorrow..but I was dying to do something now. I have surfed the net for weeks seeing things I would like to do. Then today I knew. I wanted to make a hooded towel for my son. Of course once I knew what I wanted to do cable went out which means Internet went out and I was left alone wanting to sew and no tutorial to make it better. So I winged it. This is hooded towel...my way (not the right way probably but it worked for me) Since I finally made something I finally get to play along with so many of the creative blogs I have found check out the bottom of the post for links to find inspiration for you next project. I just did a straight stitch from the bottom to the top point. I pulled the pins out as I went and back stitched at the beginning and end. Next I pinned the hood to the towel part. I made sure to center it. Again I just did a straight stitch from one left to the right and made sure to back stitch at the beginning and end. It ended up so cute and I was so proud of myself I made another one. In pink this time to give to my niece this Saturday as part of her birthday present. Now this may not be the absolute correct way to do it but it worked for me. It also gave me the confidence that I needed and beast and I are on our way to being besties for sure.. Check them out. My model is currently asleep for the night and I did not have a chance to take a pic of him in it. I made the brown first and pink second...Total time it took for both was less than an hour!! I can only imagine how much this will cut down on my quilting time! Since I finally made something I finally get to play along with the look what I made day at Creations by Kara! 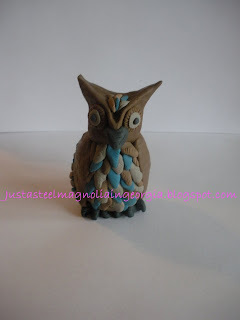 Check the post out and see what all the other crafty people have been up to! I have to get in on the fun over at Fireflies and Jellybeans too. For more of a creative fix head over there and check everyones out too!! Check out the Strut your Stuff party over at Somewhat Simple there are so many creations to check out there too! Tater Tots and jello also has a Weekend wrap up lots of links! This is our favorite banana bread recipe. My husband never liked banana bread till this one. I went through a faze where I made a different banana bread every week determined to find the best one possible...this was our winner...and you can find it here at Cooking Light. Cooking Light is a site I visit often because it never hurts to eat healthy especially when it tastes as good as the recipes I have tried of theirs. My husband, family, and friends love this banana bread. To this day I haven't told anyone that its a healthier lighter version of the traditional banana bread....However don't think that just because its healthier its different. It is so moist and so tasty you won't miss the extra fat and calories that other recipes for the same bread kind of bread pack. Tonight I made it in two smaller loaves. In one of those loaves I sprinkled in chocolate chips....not many just a 1/4 cup or so...I also tend to typically use a vanilla yogurt instead of plain...because I don't have plain yogurt in my house all that much I always have vanilla though. My son who is 1 loves it so much that he stands outside of the stove and says bite bite the whole time it is baking (every time I make it)...So far this is the only thing he does that for. Its a miracle if I get it cooled completely before I have to give him a slice...Try it and see if you don't love it as much as we do! I am a soup person. I like soup alot. Its not all I eat, but it is one of my favorite things to eat....as long as its good. This soup is great. Its creamy, cheesy and has a few vegetables thrown in there for good measure. Now you can make this as healthy as you like or not...I have made it using low fat ingredients and skim milk. Either way you go this soup is good. I will try and add a picture tomorrow..I am technology challenged and cannot get my camera to co-operate with me at this time. This soup makes plenty to feed 4 hungry adults with leftovers. Its great served in bread bowls. In a large pot over medium heat, simmer the carrots for 5 mins then add the broccoli and simmer for 10 minutes more. In a separate skillet over medium heat, melt the butter, add the onions and saute till nice and tender this usually takes 5 minutes or so. Then add the flour to the onions and stir well. I recommend a whisk for this that way you get it really smooth. Its going to form a pasty substance let this cook for about a minute. Keep stirring because you really want to cook the flour to get the raw taste out but not really brown or burn the mixture. Slowly add the milk and stir until thick. Now pour your milk mixture into the broccoli/carrot mixture in the pot and stir well. Then add the cheese, stirring until melted. Finally, give it a little taste and add the pepper the way you like it...typically we don't add salt. Hey remember me...I've been MIA...well sort of. What I have really been is alot of nothing. I had strep throat and then a sinus infection back to back....but here I am back again trying to get on top of the menu planning game. If you haven't already seriously head over to The Organizing Junkie and check out all the great ideas you can get from all the other people linking up....they can really inspire you...I know that I definetly needed it to get going today! Monday-Broccoli Cheese Soup and Pioneer Woman's Drip beef (the one with the peppers) and holy moly these were good. I have not ate red meat hardly at all since I got pregnant but I seen these and had to have them. I did mine in the slow cooker all day...did I mention how good these were? I plan to start some Amish friendship bread.